The Florida Aquarium in Tampa, Florida is the most amazing, hands on, interactive marine aquarium for children that I have ever seen. It could be called a children's "Learningquarium"!! Here you will find much more than just an aquarium. They have a botanical gardens, and also a sample of some of the habitats we have here in Florida, including many of the animals that live in them. Other than sea life represented, there are otters, ducks, turtles, ibis, flamingos, alligators, snakes, owls, frogs, penguins and more in this wildlife wonderland. What really impressed me with the Florida Aquarium, is how they really worked hard to create these wonderful exhibits. They created educational stations that are eye level to children, making them visually accessible using plexiglass, so children can get up close and see details of the animals. They also have taken great care and created many fascinating hands on exhibits to explain the various types of sea creatures, and how they live, eat, grow, and how they defend themselves. The exhibits show how each creature is unique and the games and experiments offered, help to explain their unique characteristics. This aquarium is among the top aquariums in the whole world. There is a hands on exhibit, where you can pet stingrays. Kids are taught to use two fingers and carefully pet the stingrays on the safe zones away from their eyes and tail. There is also a hands on exhibit with underwater invertebrates, like starfish and sea anemones, that kids can touch and feel. There are several small presentation stations throughout the aquarium where groups can gather to learn more about many subjects during their daily shows. 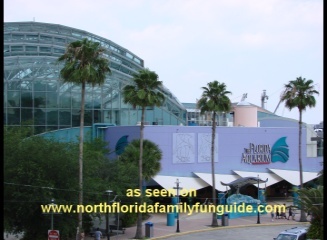 The Florida Aquarium has special programs like a Behind The Scenes Tour, where you can feed a shark, a Swim With The Fishes Tour, where kids 6 years and older can swim with the fishes for 30 minutes in the Coral Reef Fish Tank. In addition, there is a Wild Dolphin Ecotour adventure, where they take you out on Tampa Bay and see wild dolphins and manatees! They host summer camp programs, birthday parties, and corporate events too! If that is not enough to encourage your family to go, there is also an outdoor splash park, with a pirate ship, and moray eel spray guns, for hours of interactive splashing fun. Directly adjacent to the splash park is a shaded cabana grill, called the Caribbean Cantina, where they serve tropical drinks and daily specials. I was very impressed with this adventure, and highly recommend it for your whole family!